The Aseprite Importer Editor has a collection of settings that control how an Aseprite asset is imported. Pixels Per Unit This value is the amount of pixels that make up one unit of the Scene. 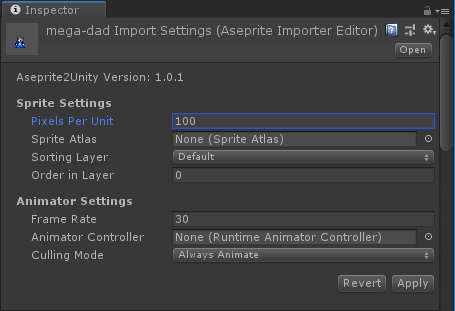 Sprite Atlas (Optional) Imported Unity Sprites will be automatically added to this sprite atlas. Sorting Layer SpriteRenderer will have this sorting layer assigned to it. Order in Layer SpriteRenderer will have this order within the sorting layer. Frame Rate How often you want your sprite animations sampled. In frames-per-second. Animation Controller (Optional) Animator component will use this animation controller. Culling Mode Animator component will use this culling mode. © Copyright 2019, Sean Barton Revision 1ffef040.